Rango is a new computed animation film from the quintessential avant-guarde director Gore Verbinski. The film centres on Rango, a chameleon and aspiring swashbuckling thespian, who finds himself in a Western town plagued by bandits and is forced to literally play the role in order to protect it. John Logan’s script, while it deals with big issues, such as the lack of water in certain countries, works best as an intellectual character piece, and its through the compelling voice talent and extraordinary emotion capture that the film truly shows its grandeur. The pacing is a delight, full of humour and fortitude, sometimes quiet and retrained, while others noisy and outlandish. It’s a film that, to its merit, dares to be in-your-face and to tell a very personal, sometimes restricted story. The real accomplishment, though, is the visual style, which makes even the best animated 3D look feeble in comparison. Meticulous attention has clearly been paid to mise-en-scene, emotion detailing, and the inspired framing of individual shots. It’s truly fascinating to behold the surprises the filmmakers dispel throughout the film. 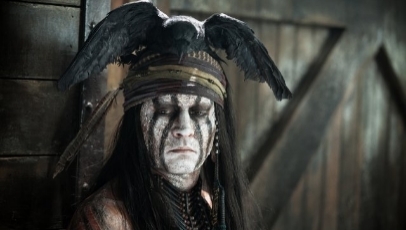 The voice cast, top-lined by an on-form Johnny Depp, each deliver inspired and witty performances. Isla Fisher, in particular, must be commended for her beguiling Western accent, much better than the Scottish accent attempted in last year’s disappointing Burke & Hare. While the action can be violent, and the dialogue more intense than other animation films, Rango excels as an innovative, intelligent and witty piece of filmmaking. It may not be to everyone’s taste, or welcome a wide demographic, but it’s a feat to embrace, not discount. The sheer imagination and heart is further accentuated by Hans Zimmer’s soaring score which, by reworking Ennio Morricone’s past scores, instills an exciting, sometimes comic aura that perfectly matches the tone of the film. Rango is a quirky, delightfully unique and inspired piece of animation.